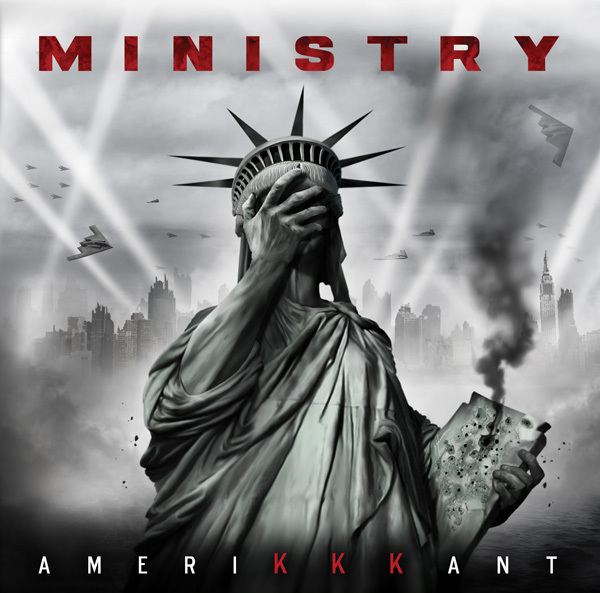 From the moment you hit play on Ministry’s latest album “AmeriKKKant”, it’s quite clear where their leader Al Jourgensen stands on the political spectrum. The album is a showcase for what the press release calls his “unadulterated rage for what’s happening in America today”, and the album’s dark carnival-gone-mad vibe is an oppressive, and frankly depressing, rollercoaster ride through life under the United States of Trump. The 9 songs are all linked as one continous piece of music, sampling Trump’s catch phrases (like his “Make America Great Again”) distorted through heavy filtering, like the soundtrack to a nightmare that unfortunately persists even after waking up. It’s a fantastic record that’s not easy to listen through, no matter where your opinion lies. If you’re pro-Trump, this album is a relentless assault on your beliefs, and if you’re against him, it’s a dark reminder of the disintegration of the aura the United States once had in the world. The band is currently on tour and will be in Montreal on Sunday April 15th at MTELUS. Their concert experience can be described as “P.T.-Barnum-Meets-Rage-Against-The-Machine,” and giant inflatable Trump chickens, Antifa soldiers and video screens projecting equally politically-imbued images can be expected to complement the music. The band has also been involved with local voter organizations to register new voters and inspire concert goers to become involved in exercising their rights. This record and tour is a great reminder of a time gone by when rock musicians used their platform to push for change, and mobilize people to stand up for what they believe in. The tour also features a lineup of very special guests including Fear Factory’s Burton C. Bell and DJ Swamp (Beck and The Crystal Method), as well as talented Ministry personnel Sin Quirin and Cesar Soto on guitars, Tony Campos (Fear Factory, Static-X, Asesino, Cavalera Brothers) on bass, and keyboardist John Bechdel (Killing Joke, Fear Factory). The band is playing MTELUS on April 15th 2018, with support from The God Bombs and Chelsea Wolfe. Tickets are available here. Don’t miss it!